With more than 100 years of history and experience in optical design and manufacturing, Qioptiq is renowned for its standardized high end products and customized premium solutions for machine vision. 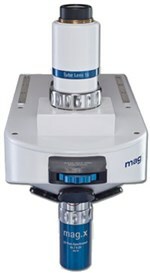 The mag.x system 125 is the first off-the-shelf microscope system that is specifically designed to be used with large sensors with a chip diagonal of up to 56 mm. The system is fully modular and can be adapted to many applications that require high resolution with large field-of-view. Mag.x System 125 … Exceptional resolution covering broad fields of view Ideally suited for precision micro-inspection applications, the new mag.x System 125 from Qioptiq combines precision engineering with innovative optical design to deliver exceptional resolution across broad fields-of-view (up to 12.5mm Ø depending on configuration). There are numerous applications that benefit from the versatility and superior optical performance of this all new micro imaging system. This combination of high-resolution optics and large-format sensor optimization expedites many inspection tasks and enables other applications which may have previously been altogether unachievable.